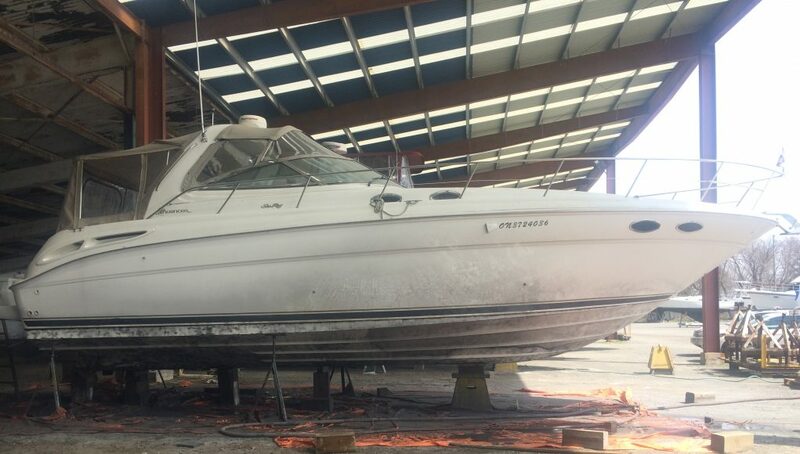 Just about every boat has, or should have, bottom paint of some sort. 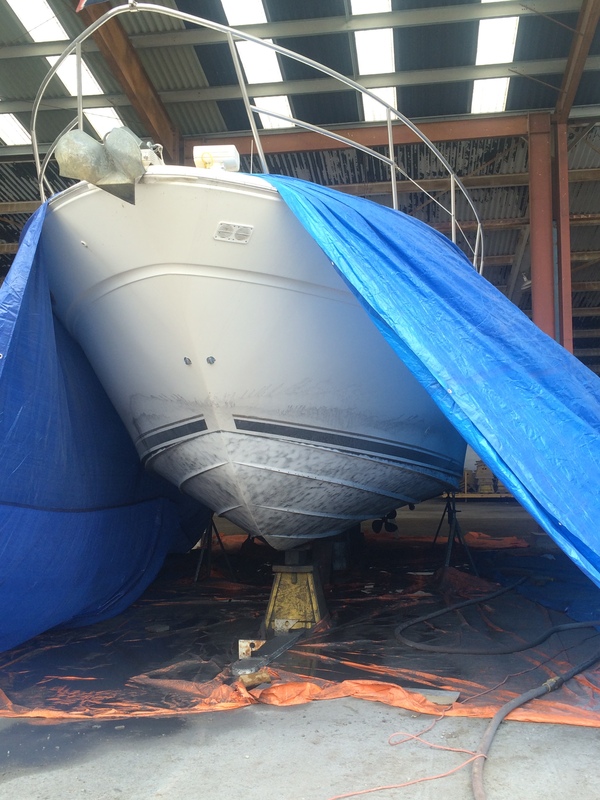 Often called anti-fouling paint, this underwater coating is designed to protect the hull from things that thrive in dark, wet conditions that want to form an unholy union with your boat and could lead to corrosion or damage. It’s not 100% foolproof. You still need to keep an eye on it and there is no one-size-fits-all solution. 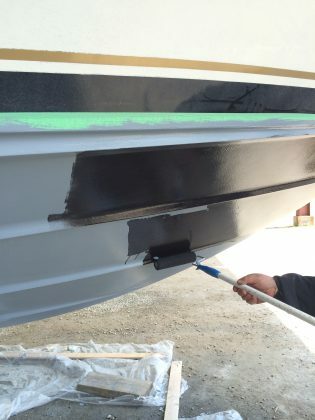 There are differences based on hull materials (wood vs. aluminum vs. fibreglass), water type (salt water vs. freshwater vs. brackish water) and even type of boating you do (there are some high-end, expensive bottom paints designed for racing that reduce drag), but it helps. A lot. 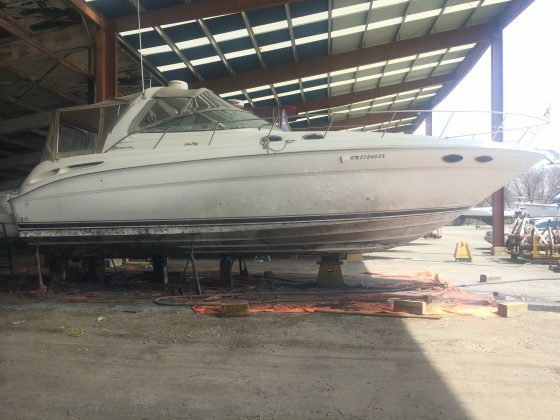 You’ll have to research what you have on your boat, what you should have and when it was put on and that will dictate when you need to touch it up or replace it. 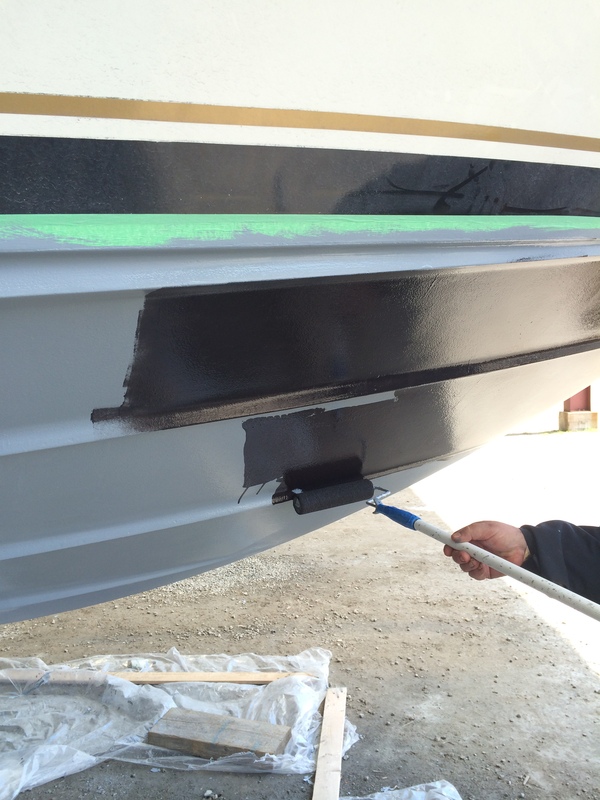 My boat could have gone another season without new paint, but it was worn. Given I didn’t get the bottom paint details off who I bought it from, I wasn’t absolutely certain what it was. My best course of action was to strip it and start fresh. 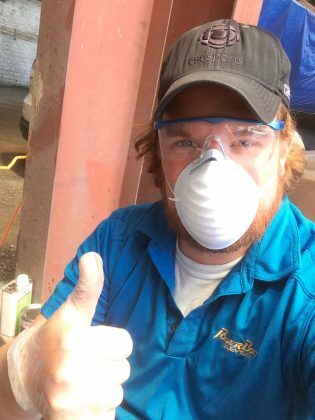 Sometimes you can just rough up the surface with sandpaper and the new stuff will stick, but if the chemistry is way off, it won’t. This isn’t cheap enough that you won’t care and it certainly isn’t the kind of job you want to redo if you don’t have to. 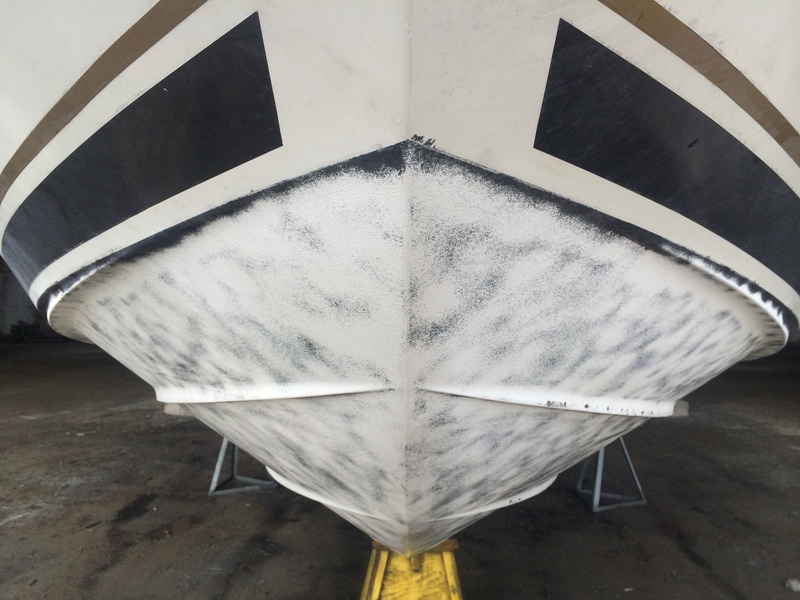 Sanding off bottom paint can be a long, painful (on the shoulders, especially) and dirty job. There is a cleaner, faster (though more expensive) option: blast it off. 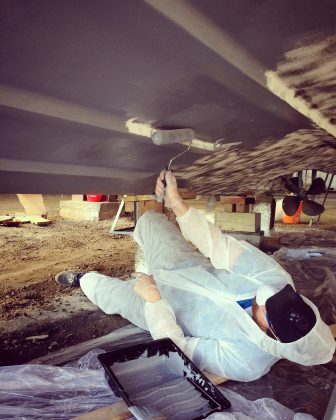 Traditional sandblasting is rough and dangerous on a fibreglass boat hull as it’s primarily sand, with some water to keep the dust down. The marina I store at for the winter recommended a local company that had something called a GeoBlaster. It’s 80 percent water so it’s much more delicate. There are still some hand-sanding moments required, around the edges and such, but this clears off the old paint in a matter of hours, not days. 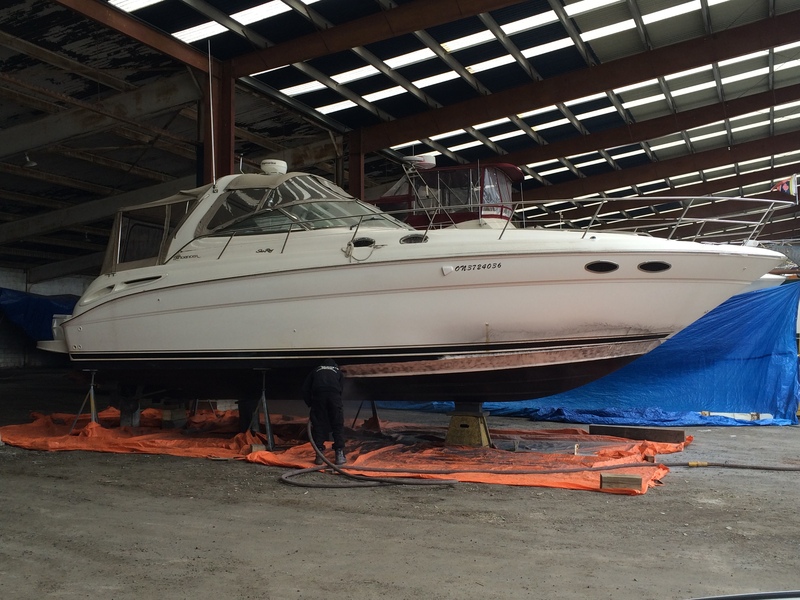 When you’re down to the bare fibreglass, take the opportunity to inspect for any nicks or dents. To fill those I used Watertite, a two-part epoxy from Interlux, which forms a thick Play-Doh style texture. You just mix the white and blue parts together until the putty is a uniform colour. Use it to fill any little holes or dings and let it dry overnight or for a few days. 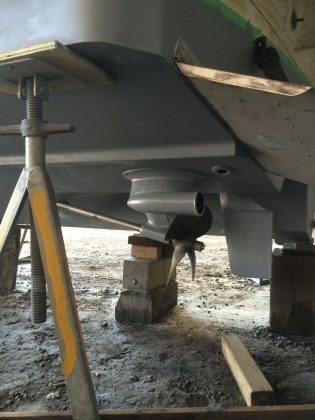 When it is dry, sand it to be flush with the hull and you’re good to go. As you likely already know, my boat is a 2001 Sea Ray Sundancer kept in Lake Ontario, so I went with for Interlux MicronCSC as the bottom-paint of choice. 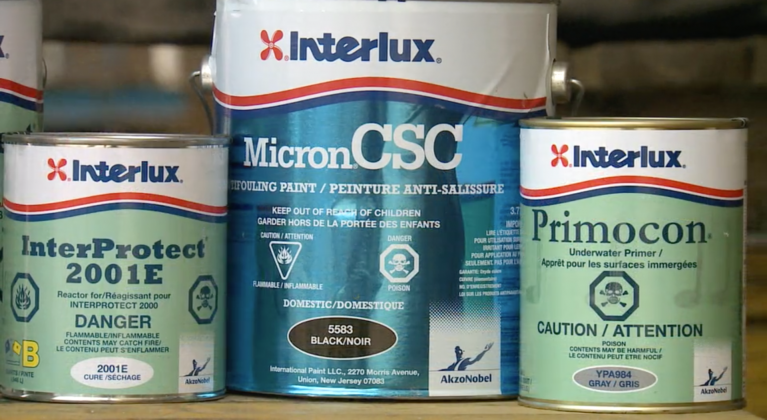 It is a multi-season option that means you can haul, store and re-launch without having to repaint like you might with some cheaper options. In a nutshell, this uses less copper than other antifouling paints in a more efficient manner and wears down at a controlled rate, like a bar of soap, which gives it that multi-season effectiveness. Before the application, I had to prime. And before I could do that, we had to wash down the hull to make sure it was pH neutral, clean and free of any debris from the GeoBlaster. 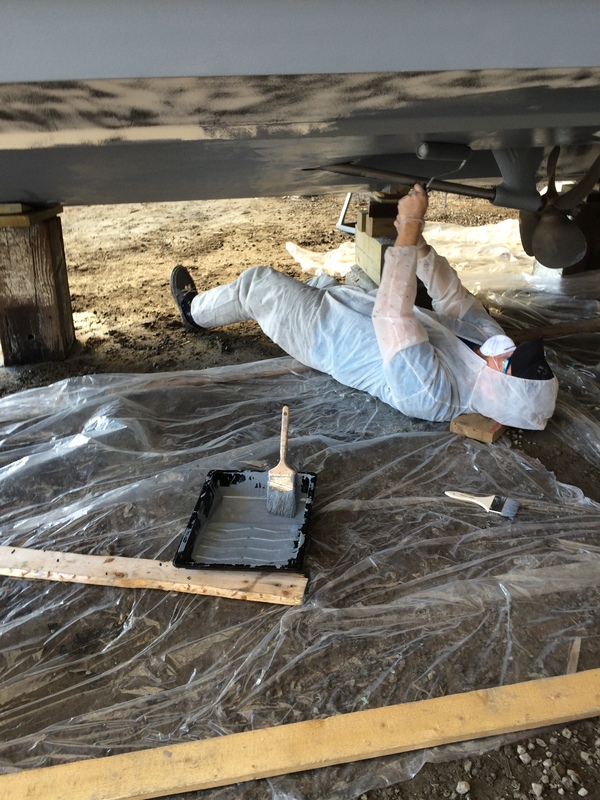 The primer coat we used was Interprotect 2000e, a two-part epoxy to protect from water absorption that can lead to problems from osmosis and blistering. 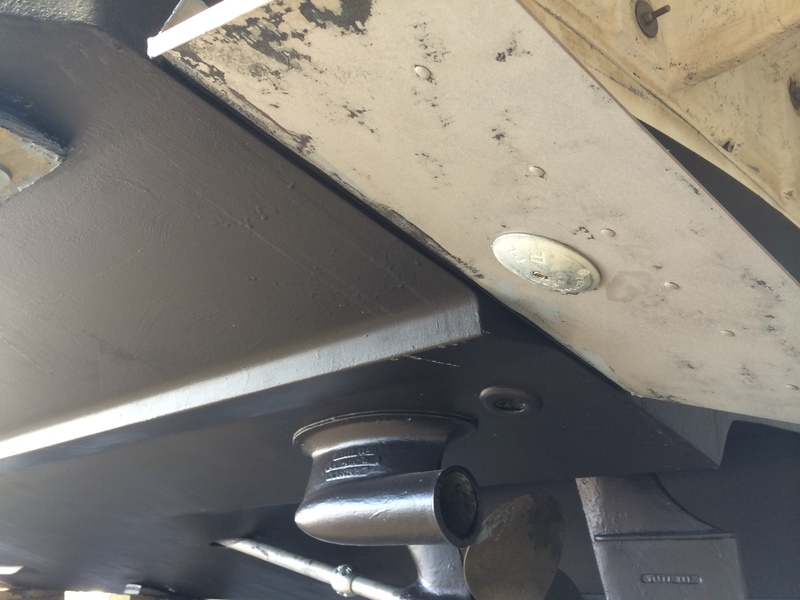 When you’re applying it to metallic hardware, like the bronze exhaust on this boat, it helps to dilute it slightly—about 10 percent—so the Interprotect gets in every nook and cranny, like warm butter on a hot English muffin. For the rest of the hull, it went on undiluted and multiple times. 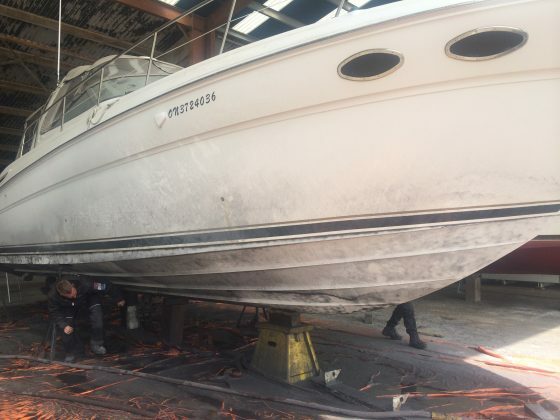 The basic calculation of how much you’ll need is the length in feet multiplied by the width of your boat multiplied by 0.85 since it’s not a perfect rectangle but curves in at the bow. That’s the approximate square footage. You then divide that by 60 and you know how much. In this case it’s 38 feet x 13 feet x 0.85 = 419.9 / 60 = 6.99 gallons total (7 cans). That worked out to five coats, spread out over a few days. It’s as fun as it sounds. In fact, if you find you have too many friends, invite a few of them along to help. You won’t have that problem by the end of the project! You can spread out the earlier coats of the Interprotect, but the final coat needs to be done the same day you put on the first coat of MicronCSC. That’s because you need the Interprotect to be not fully dried and tacky so it chemically bonds with the MicronCSC. The thumbprint test is the easiest way to check if it’s ready. With your thumb, even with a disposable glove on, press on the Interprotect. If it leaves a thumbprint, it’s starting to dry, but isn’t fully wet and you’re ready to rock. 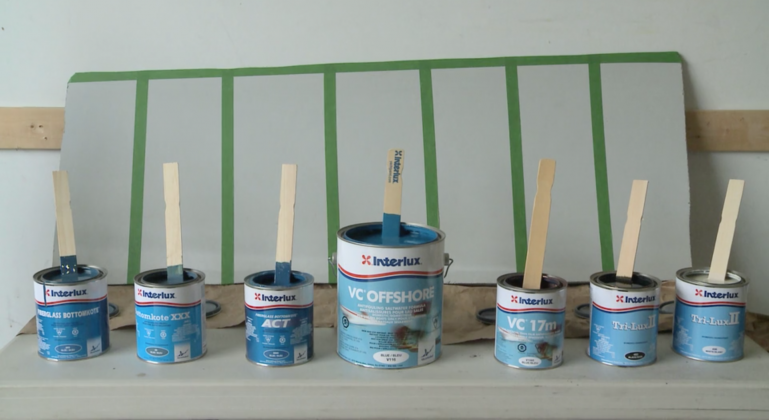 The MicronCSC is thinner and goes on much more easily than the primer coats. By this point, that’s a nice change. Unfortunately, it’s no less messy, considering you have to crawl around underneath the hull. I wore a disposable painter’s coveralls over clothes that I was already going to pitch so I didn’t have to worry too much. Even still, this is a messy job and it’s important to put a tarp or covering of some sort on the ground so you’re not dripping paint or primer everywhere. The time between the antifouling coats doesn’t really matter which adds some flexibility to your schedule. 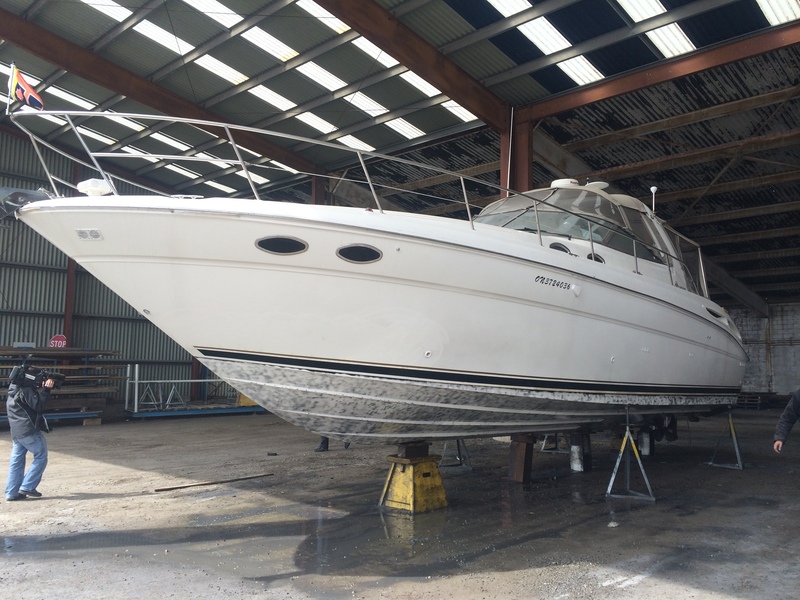 It needs to be dry and so the next day is usually a good bet for the minimum time. As for the maximum, you can do it weeks or even months later without risking the chemical integrity or effectiveness. 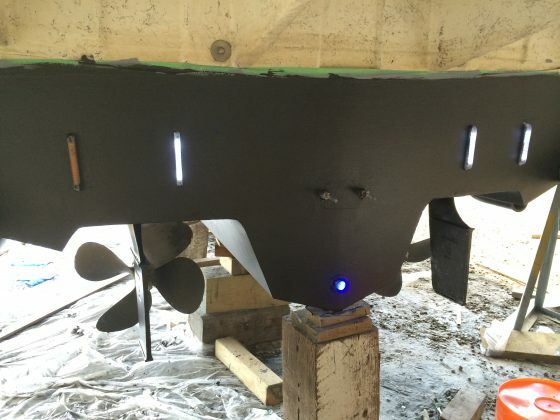 That final coat needs to be fully dry before splashing though, so at least 16 hours, but give it a day or two if possible. The good news is that you’ve protected your hull from all manner of icky and sticky things that want to damage it. The great news is you shouldn’t have to do this again for years, except for possible touch ups. When I hauled out at the end of the season, after a blast with a power washer the hull looked as if it had just been painted. I was amazed. 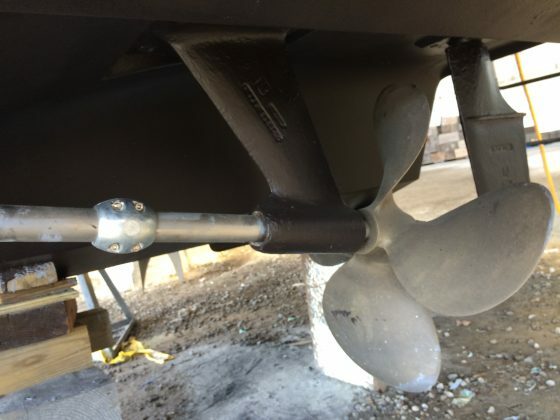 There were one or two little spots the size of a dime where I may not have been as thorough with my roller and one section of the bow where I bottomed out on a sandbar (it was an expletive-spewing moment at an unkempt marina that shall remain nameless). 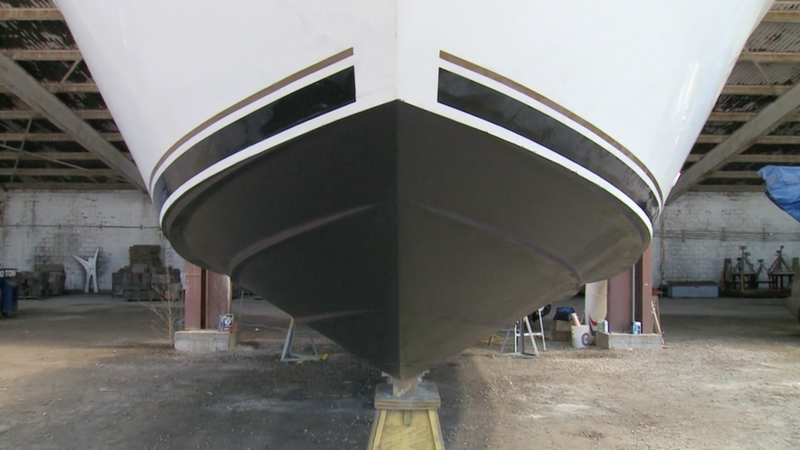 Apart from those tiny areas, 90 percent of the hull looked as if it were painted that month. When this spring rolled around, I only had to spend 15 minutes doing my little touch-ups, so I knew I made the right call. It’s just a shame that much work goes into something no one ever sees so you don’t have any bragging opportunities! This project is featured in the 2017 Summer Issue of Boats&Places and the 2017 season of PowerBoat Television.